BERKELEY, CA � A scientific whodunit unfolding at Lawrence Berkeley Laboratory (LBL) and on the UC Berkeley campus since early summer has stimulated spirited debate among geologists, paleontologists, biologists and physicists around the world. The story revolves around a piece of pink and white limestone in whose layers are buried evidence for what paleontologists call the "great dying," the period some sixty-five million years ago when fifty percent of the earth�s animals and plants were mysteriously wiped out. The rock is a sample from the sedimentary deposits near Gubbio, Italy, which were once buried beneath the sea and have since been lifted and exposed in roadcuts. When you look closely at the rock, you see a band of brown clay at the boundary between the limestone which was laid down during the Cretaceous period sixty-five to one hundred million years ago, and the red limestone from the more recent Tertiary period. The brown clay was deposited about sixty-five million years ago, at the time of the great extinctions. Looking through a magnifying glass, you see that the Cretaceous limestone is crowded with fossils of a tiny crustacean called Forminifera globutrucana. They are entirely absent from the clay layer. In the Tertiary limestone, a few of their relatives reappear. Though scientists have known for more than a hundred years about the extinctions from fossil records like these, no one knows what event might have caused such a world-wide wipeout. What brought the rock to LBL were conversations between physicist Luis Alvarez and his son Walter, an associate professor of geology on the UC Berkeley campus. Walter Alvarez has spent the last several years dating similar rock samples from Gubbio by a method called magnetic stratigraphy, using the reversals of the earth�s magnetic field, which are recorded in the rocks, to date deposits. Luis Alvarez wanted to know how long the forminifera extinction lasted before the species began to reestablish itself. One way to find out was to measure the sedimentary rate -- how long it took for the clay to be deposited on the ocean floor. He suggested using iridium as the yardstick. Iridium is a stable, silver-gray metal, rare in the earth�s crust because it is bound up with iron in the earth�s core. But out in the rest of the solar system, it is a thousand times more abundant. It is brought to us by such solar system visitors as meteorites, which burn up or fragment and drift as fine particles through the atmosphere. "Because we know the rate at which extraterrestrial matter rains down on the earth each year," says Alvarez, "it occurred to me that by measuring the abundance of iridium in the sedimentary deposits, we might be able to tell how long a period of time was represented by that clay layer. "I later learned that this idea was twenty-five years old, and it had been implemented ten years ago," adds Alvarez parenthetically, but fortunately he didn�t know that at the time. The Alvarezes went to see Frank Asaro and Helen Michel, LBL nuclear chemists who have developed a technique, called neutron activation analysis (NAA), for making precise measurements of very low elemental abundances in various materials. Their NAA facility is one of only a few in the world that could undertake the difficult analytical tasks required by this problem. Taking their samples from the clay layer and from the younger and older Tertiary and Cretaceous sediments on either side, Asaro and Michel measured iridium and thirty other elements. They discovered a sudden increase in the abundance of iridium in the clay twenty-five times more than normal, in comparison with other elements. After the initial jump in the clay layer, the iridium tapered down, more or less exponentially to the background, forming a spike. This unexpected increase, called an anomaly, coincides with the extinctions. "The anomaly could have been caused by an increase in the amount of iridium which was deposited along with the clay," says Helen Michel, "or else the iridium might have remained constant, and the rate at which clay was deposited slowed down." "That doesn�t seem likely," she adds, because Walter Alvarez�s study of the reversals of the earth�s magnetic poles does not show any significant decrease in the sedimentation rate during that period." "If there was an increase in the deposition rate of iridium-rich material, a source on the earth would be unlikely, since iridium is one of the least abundant elements in the earth�s crust," comments Asaro. "If, on the other hand, the source is extraterrestrial, it would be naturally enriched in iridium and would be compatible with our measurements. So we believe the extraterrestrial hypothesis is more likely." It wasn�t the first time that an extraterrestrial source has been considered as the cause of the great dying, because a satisfactory explanation has never been proposed for such wide extinctions. No sweeping climate changes, such as the ice ages which would follow, are recorded in the rocks, and the theory that dinosaurs simply became obsolete after ruling the earth 150 million years doesn�t account for the demise of so many other species. But until the discovery of the iridium anomaly at LBL, there was no direct evidence to support an extraterrestrial theory. Once the anomaly was discovered, the problem was to find a source that would deliver the extra iridium and was capable of causing the world-wide extinctions. One popular theory discussed at great length in the scientific literature attributes the extinction to certain effects caused by a nearby supernova. For example, if a star exploded a light year away, the increased cosmic ray intensity could have killed the animals by giving them all an intense dose of radiation. The problem is that the probability of such a supernova explosion is only about one in a million, in the last one hundred million years. From the amount of iridium measured in the rocks, supernova explosion would have had to be a tenth of a light year away. This upped the odds to a probability of one in a billion. In spite of the unfavorable betting odds, the supernova theory had the advantage that it could be checked experimentally in a series of delicate tests done by neutron activation analyses. Because it is almost certain that all elements heavier than nickel and iron are synthesized in the intense neutron fluxes of a supernova, Asaro and Michel set out to find plutonium-244. This isotope, with a half-life of about eighty million years, should still be in the clay layer, if the source of the iridium had been a supernova. Asaro and Michel brought ideal credentials to this assignment, since they were both experienced plutonium chemists before becoming NAA specialists. From the clay sample, they separated out a few drops of acid solution which they then evaporated. If the sample contained plutonium, most of it would be found in the evaporate. Though the procedure sounds simple, Asaro and Michel in fact separated away almost all known elements, in a real "tour de force" of chemistry. When they irradiated the evaporate in the UC Berkeley campus nuclear reactor, and looked for the gamma ray signature of plutonium-245 (into which plutonium-244 would have been converted), they came up with "no signal." They could have detected one tenth of the expected amount, if it had been present, so the results looked bad for the supernova theory of the extinction. Since astrophysicists believe that each supernova should leave its own fingerprint in the isotope ratios of the different elements made in its oven, Asaro and Michel embarked on the difficult task of measuring the ratios of the two iridium isotopes. The tests showed that the iridium from the spike had the same isotopic ratios as solar system material, so again the evidence was against the supernova theory. Maynard Michel, using his mass spectrometer with its supersensitive electron multiplier detector, is planning on looking further for the plutonium-244. But with two experimental strikes against it, plus the fantastically small theoretical probability, it appears the supernova just doesn�t fit. Michel and Asaro have widened the search by measuring samples from similar sedimentary deposits in Denmark. Though the Gubbio samples are from four sites over a twenty-seven kilometer area, it was important to determine if the iridium spike occurs in samples from other locations. "If we couldn�t find an iridium spike in other sedimentary deposits, we would have a hard time convincing anyone, including ourselves, that we had made any observations relating to the Cretaceous-Teritiary extinctions, which we know are world-wide," says Alvarez. In recent NAA tests on the Denmark sediments, the group found an iridium spike that is larger by a factor of between five and ten than the iridium spike in the Gubbio deposits. "Now that the basic experiments have been done, and it seems clear that the iridium came from an extraterrestrial source within the solar system," says Alvarez, "we will spend the next few months trying to put together a satisfactory theory of the extinction. Our theory must agree with known properties of the solar system and with documented evidence from paleontology." Editor's note: The research team went on to publish a seminal 1980 paper in Science magazine, "Extraterrestrial cause for the Cretaceous-Tertiary extinction." In the ensuing years, they provided further evidence to document their theory that a large impact had occurred at the end of the Cretaceous, and initiated the extinction event. In 1991, scientists found the Chicxulub crater, a 180-kilometer-wide, 20-kilometer-deep structure along the northern coast of the Yucatan peninsula at the Gulf of Mexico. It is buried beneath up to a kilometer of Tertiary carbonates. Among scientists, it is now widely believed that the Chicxulub structure represents a large meteorite impact that was responsible for the mass extinctions of 65 million years ago. 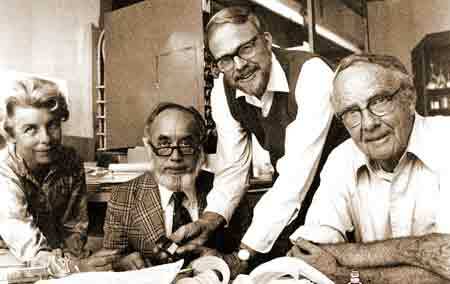 MASS EXTINCTION/IMPACT RESEARCH GROUP (LEFT TO RIGHT) HELEN MICHEL, FRANK ASARO, WALTER ALVAREZ AND LUIS ALVAREZ (1969 PHOTO). Does a companion star to sun cause periodic mass extinctions on earth?